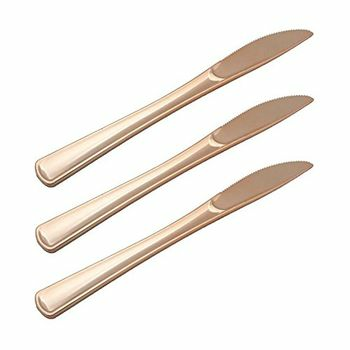 Reflective Rose Gold Plastic Knives, 20 ct.
Home»China-like Tableware»Midnight Blue Collection - Various Colors»Midnight Blue Collection - White w/Blue & Rose Gold Border»Rose Gold Knives Plastic Silverware, Fancy Plastic Cutlery 20ct. 20 PACK SOLID ROSE GOLD KNIVES: These sleek modern and stylish plastic silverware rose gold forks, were designed with an elegant and formal finish, making them the perfect set of cutlery for wedding receptions, dinner parties and of course regular household use. LOOKS LIKE REAL SILVERWARE: Although these plasticware forks are disposable, they look like real upscale tableware to the eye, so you can save time washing dishes without compromising on beauty and design at your event. QUALITY AT ITS FINEST: Our cutlery is made from heavy duty material and produced with top of the line quality care and control. Our quality is what separates us from other brands, our utensils are made to complete your table setting with a bang. SPECS: Our knives are 7.5" inch tall. Made from high grade plastic so they don�t snap on you. Each pack has 20 eating forks included. This set has only includes the knives, be sure to complete you setting by ordering our forks, spoon, teaspoon set. This flatware set is great for buffet table, picnic and more.